Although he has had just 17 pro fights – fight number 18 comes this Saturday night against challenger Eric Molina – Anthony Joshua is already speaking about when he plans to call it a day and retire. The reigning IBF heavyweight champ, speaking with The Mirror, says that if things go to plan he will retired in five years at the age of 32. Joshua says he could retire today if he wanted to, as he is happy. Yet right now, the 27 year old is enjoying boxing and he wants to leave behind a legacy. Over the years, we’ve heard plenty of fighters speak about their planned date/age of retirement – remember when Miguel Cotto said he quit at age 30? Amir Khan said the same thing, so did Oscar De La Hoya. But, as retired heavyweight great Lennox Lewis once said, boxing “is like a drug – you always want one more [fight].” Will Joshua remain unbeaten over the next five years? Maybe. But if he doesn’t, if he instead suffers a loss that he finds himself needing to avenge, maybe he will stick around longer than he plans to. Five years is not all that long, and time really does fly. At around two or three fights per year, Joshua’s time-frame would see him have a further ten to 15 fights after Saturday’s title defence, his second. 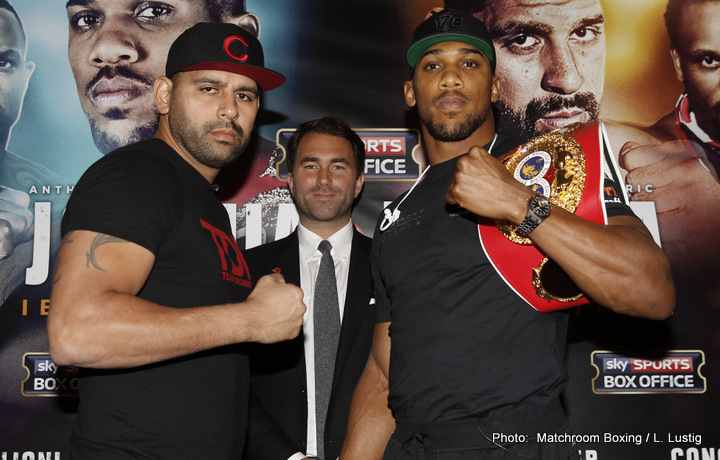 Will Joshua really walk away as a 28-0 or a 33-0 fighter? Let’s get Saturday out of the way first. Does anyone else smell upset going into Joshua-Molina?